Celtic Thistle Stitches: New to Me in May! This month my New to Me projects have all been about freedom! Free form Machine Embroidery on this Seagull Cushion and the Birds on a Wire below was definitely a first for me! I enjoyed the Free form Embroidery so much that I attempted some more Free form but this time FMQ lettering, another first! If you look really closely you can see "Rioja" spelled out in the quilting above! So that's my New to Me activities this month, now it's your turn to show what you have tried that is New to You this month. I don't have a blog, but I did my first ever paper piecing this month. Finally overcome my fear! 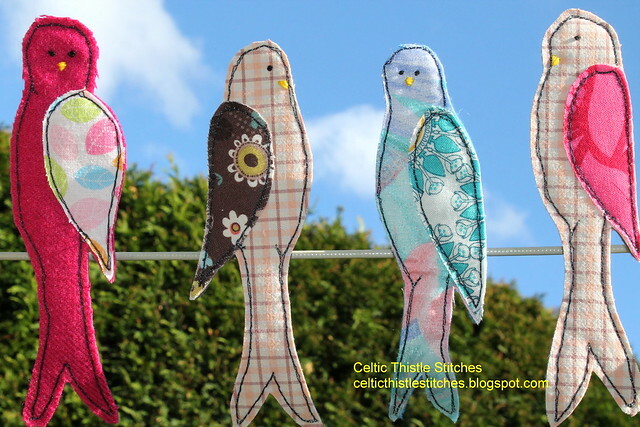 Great free form stitching, love those birds! 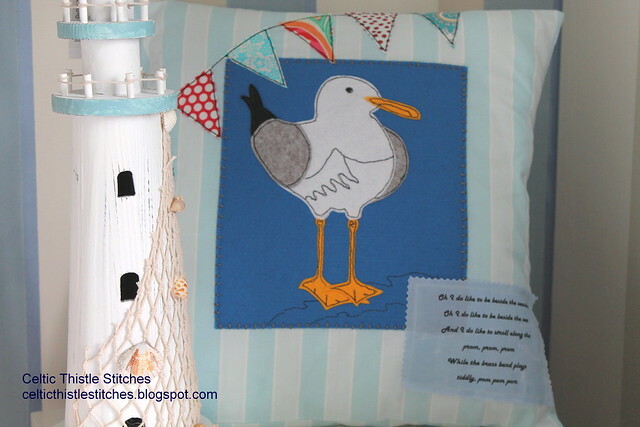 Well done on the fabulous free form machine stitching, your cushion is beautiful and I love the birds too. 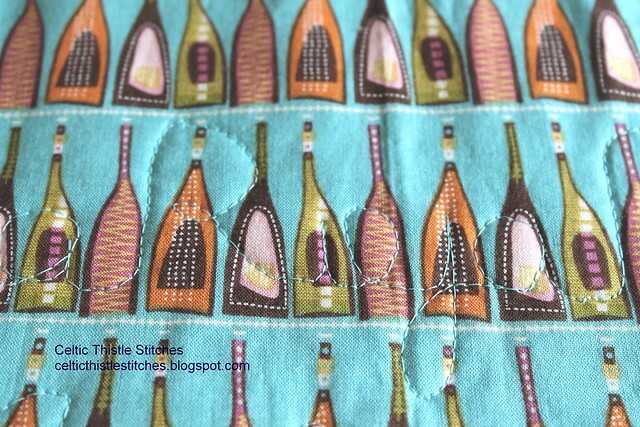 Your wine-inspired quilting is such a great idea! I would like to steal your seagull! I felt sure I'd tackled something new this month, but on checking, I haven't. I'd better get my act together next month!!! You've done some fab pieces this month and I'm loving the wine bottle fabric and particularly our fmq quilting on it - Rioja is certainly one of my favourites. I went back through my 'May' and was surprised to find that not only had I achieved more than I'd remembered but that it was almost all 'new to me', hence the huge collection that I've added to the party!!! I loved your birds enough to pin them. And I have not forgotten about the Australian Afternoon Tea - it is waiting to be posted Fiona. Thanks for inviting me to link up this month. You did great trying free form embroidery. Love the birds! I just love your birdies! love those birds on a wire! I've completely failed to do anything new this month!